The exhibit, Good Medicine, Bad Behavior: Drug Diversion in America, resides at the DEA Museum & Visitors Center is located at 700 Army Navy Drive in Arlington, Virginia. The Museum is located directly across the street from the Pentagon City Mall at the corner of Army Navy Drive and Hayes Street. 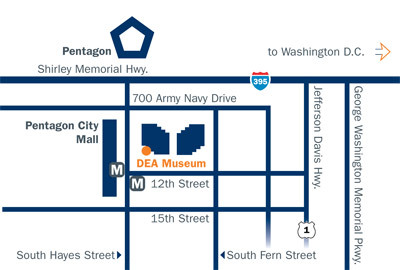 The Museum is also easily accessible from the Pentagon City Metro Station, one block south of the Museum on Hayes Street. Street parking in the area is limited. Paid parking is available at the Pentagon City Mall parking garage. From Washington, D.C. – Take I-395 South across the 14th Street bridge to exit 9B for Route 1 South, Pentagon City. Take Route 1 South one exit to the exit for 15th Street. Turn right on 15th Street and follow 3 blocks to Hayes Street. Turn right on Hayes Street and follow two blocks to the DEA Museum on the right. From Virginia – From I-495, take I-395 North to Exit 8C for Route 1 South, Pentagon City. Follow off-ramp to intersection of Hayes Street and Army Navy Drive. The DEA Museum is located at the corner of Army Navy Drive and Hayes Street on the left. From Northern and Western Maryland – Take I-495 South across the American Legion Bridge. Exit to the George Washington Parkway South. Follow the GW Parkway to the I-395, Richmond exit. Immediately move to the far left lane for Exit 9B for Route 1 South, Pentagon City. Take Route 1 South one exit to the exit for 15th Street, Turn right on 15th Street and follow three blocks to Hayes Street. Turn right on Hayes Street and follow two blocks to the DEA Museum on the right. From Eastern and Southern Maryland – Take I-495 across the Wilson Bridge to Exit 1 for Route 1 North. Take Route 1 North through Old Town, Alexandria and Crystal City to exit for 15th Street and Pentagon City. Turn left onto 15th Street and follow three blocks to Hayes Street. Turn right on Hayes and follow two blocks to the DEA Museum on the right. Buses & Vans – Buses and large vans may drop off at the curb in front of the DEA Museum entrance on Hayes Street prior to parking. Parking for buses is available across the street in front of the Fashion Center at Pentagon City Mall. Vans may use the Pentagon City Mall parking garage with entrances on Army Navy Drive and 15th Street.